The story of streaming continuing to expand the US recorded music industry gathered pace in the first half of 2017. 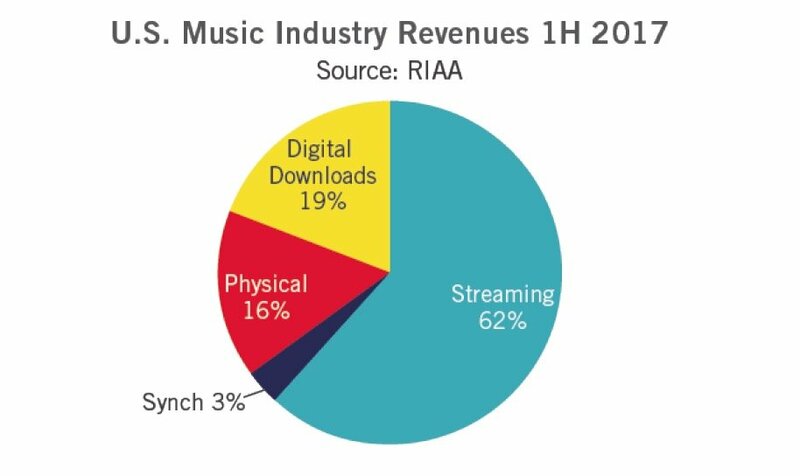 According to RIAA stats, retail revenues from music grew 17% in the first half of 2017 to $4bn. Wholesale revenues – those pouring into labels after retail deductions – grew 14.6% to $2.7bn. The main driver of this jump was full paid subscription, which jumped 49.5% year-on-year in retail sales terms, hitting $1.49bn in the first half of this year. ‘Limited’ (ie. not fully on-demand) paid services generating $224.7m in the six months – up by a whopping 224.7% year-on-year. Combined, these paid-for services were up 61% to $1.7bn. Elsewhere in the streaming sphere, SoundExchange distributions fell 15.8% year-on-year in H1 2017 – no doubt largely due to direct deals struck between the labels and services such as Pandora. Those direct deals certainly help explain why ‘other ad-supported streaming’ – which reps non-SoundExchange ad-funded streaming income – leapt 4021% year-on-year to $153.1m. On-demand ad-funded streaming services were up 37.1% to $273.2m. In total, streaming contributed $2.48bn to the US recorded music business in the first half of the year, up 48.1% on H1 2016. 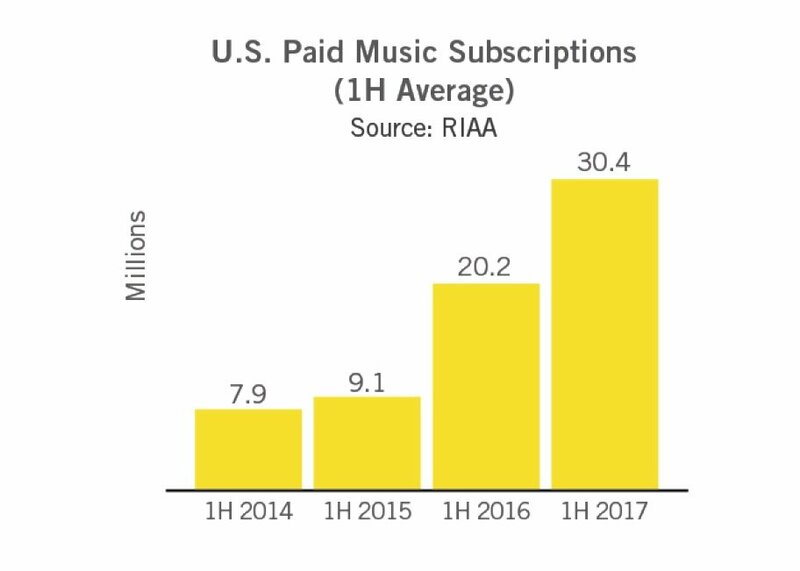 Perhaps the most encouraging news from the RIAA’s figures regards streaming subscriber numbers. At the end of June this year, there were 30.4m paying subscribers to music services in the US. That was up 50.6% on the 20.2m paying subs attracted at the end of H1 2016 – and more than three times the figure seen just two years ago (9.1m). Digital download sales sunk again, down 23.8% to $757m – compared to $993.5m in the first half of last year. CD album revenues dropped by just 2.9% in the first six months of this year to $430.6m. Vinyl grew yet again, up slightly by 3.2% in retail revenue terms to $181.7m. In total, overall physical music sales dropped by a teeny 1.3% to $632.2m. 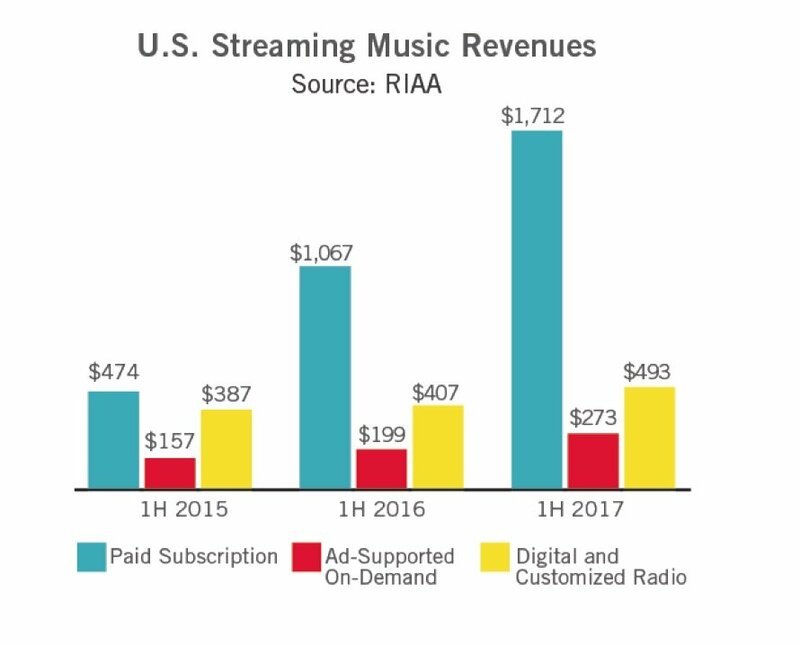 That all meant that streaming accounted for a whopping 62% of US music retail revenues in the first half of this year. Physical sales contributed 16% of the total pie, with sync on 3%. 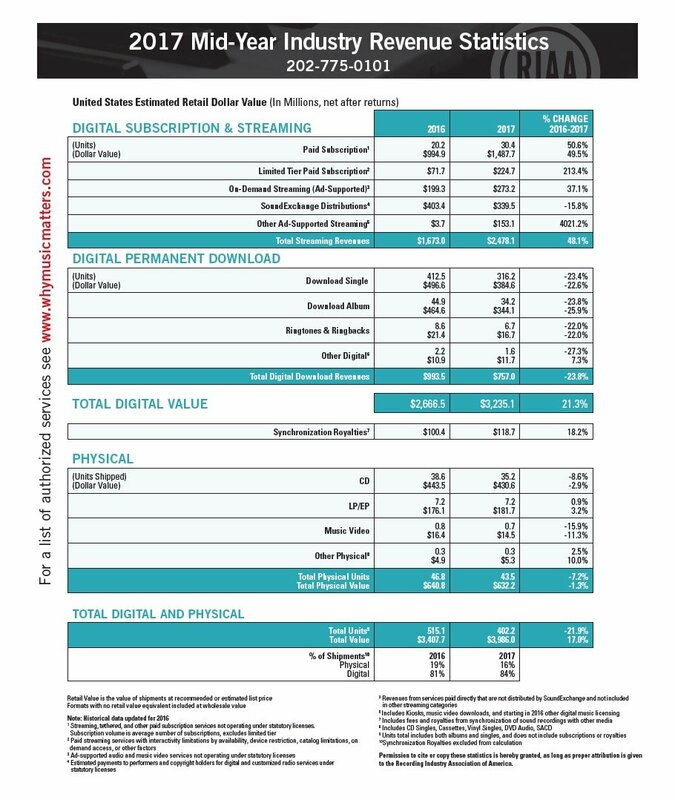 Interestingly, digital downloads drop gave it a market share of just 19% – just two years after it was the biggest music format in the US on a value basis.